During the long downturn in R&D productivity, a handful of biopharmaceutical companies have consistently bucked the trend. How did they manage it? After all, they have experienced the same industry pressures as their peers—pressures such as lengthier R&D cycle times, higher costs of failure, and sharper regulatory scrutiny. The main differentiating factor turns out to be organizational effectiveness: the way that the R&D organization creates a context that encourages cooperative behavior among its staff. A promising approach in this regard is to pursue smart simplicity, a potent new system for managing the complexity of modern organizations and turning it to advantage. The case of Bristol-Myers Squibb Company is instructive. Already one of the outperformers, the company has developed a program that further enhances cooperative behavior among its workforce. R&D leaders at other companies can draw valuable lessons from the case, though they will, of course, have to take their company’s own unique circumstances into account. Productivity in biopharmaceutical R&D has been declining for decades, reaching an all-time low in 2008. When the performance of the industry’s major companies is disaggregated, however, another interesting finding emerges. There is a distinct split: high performers are generating strong returns, as well as producing transformational therapies of high value to patients in need, and low performers are registering returns below their cost of capital. Of course, R&D productivity has many determinants, which range from talent level to serendipity, but it turns out that this bifurcation of performance is largely attributable to just one broad factor: the effectiveness with which those in the organization combine their efforts in pursuit of its mission. By maximizing this organizational effectiveness, companies can overcome several of the industry’s systemic challenges and reap many of the elusive benefits, including market-leading productivity levels. This report describes in more detail what this organizational effectiveness entails, why it is successful, and how R&D leaders can leverage it to the full within their organizations. 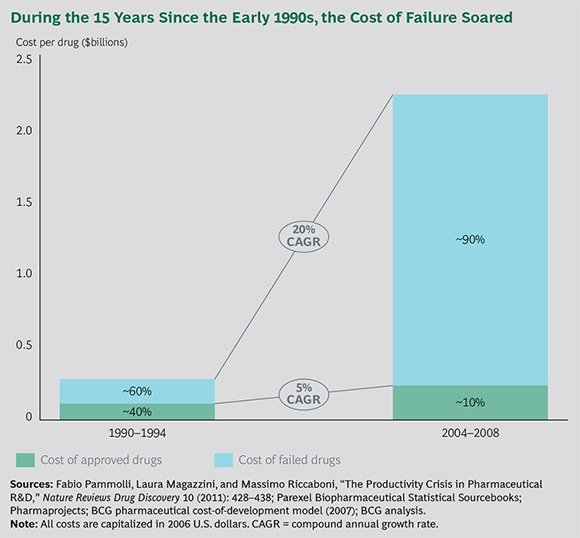 Jack W. Scannell, Alex Blanckley, Helen Boldon, and Brian Warrington, “Diagnosing the Decline in Pharmaceutical R&D Efficiency,” Nature Reviews Drug Discovery 11 (2012): 191–200. I. Kola, “The State of Innovation in Drug Development,” Clinical Pharmacology & Therapeutics 83 (2008): 227–230. 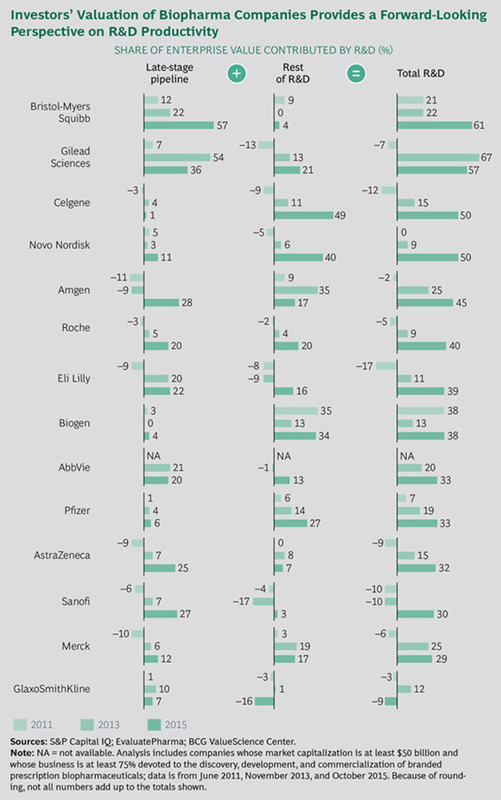 “Pharmaceuticals: Exit Research and Create Value,” Morgan Stanley Research Europe, January 20, 2010. The latest figures do suggest that the decline has leveled out or perhaps even reversed. This uptick is due largely to the exciting stream of promising recent developments—such as new technologies, a new understanding of biology and disease, and the proliferation of data on human health—leading to breakthroughs in previously intractable areas, such as immuno-oncology, cardiovascular disease, and hepatitis C. Some argue that another driver of the stronger figures may have been the breakthrough therapy (BT) designation adopted by the U.S. Food and Drug Administration. In 2014, 10 of the 53 new molecular entities approved were BTs, including the five drugs with the highest estimated peak sales. However, it remains to be seen whether the BT designation really has contributed sustainably to increased productivity or whether we are just seeing a one-time acceleration of approvals. This upward trend is very welcome, but does it really mark a turning of the tide, or is it just a sustained blip? Certainly it is no cause for complacency: serious concerns remain about the returns on drug development and the impact that poor returns could have on the pharmaceutical enterprise as a whole. Drug R&D—translating biological insights into impactful medicines—is the lifeblood of the biopharmaceutical industry: if innovation falters, returns languish, and the industry then enters a vicious cycle of attracting less investment capital, thereby diminishing its viability and its power to contribute to human well-being. Longer R&D Cycle Times. It now takes about eight years for a drug entering clinical testing to reach the market (if it gets to market at all), increasing the carrying cost of pipeline assets and making it difficult for feedback to have an instructive effect on managerial decisions. Higher Regulatory Hurdles. Stricter requirements have led to a higher burden of proof—tougher end points, larger and longer clinical trials, and an increased demand for pre- and post-approval market data. Higher Efficacy Expectations. Given the growing catalog of effective generics, any new rival drug has to excel conspicuously if it is to gain a major foothold in the market. (It would, for instance, take a mighty impressive new antihistamine to surpass the appeal of cheap generic cetirizine or loratadine.) There is little low-hanging fruit remaining. Increased Competition. Fewer and fewer areas of significant unmet need still offer the prospect of high returns, and the industry has narrowed its R&D focus accordingly. As a result, competition has grown fiercer. Increased Complexity of Targets and Poor Predictive Models and Efficacy Surrogates. In key areas of unmet need that companies are focusing on today, such as Alzheimer’s, the predictive models are poor and the targets are complex and challenging. Soaring Costs of Failure. Late-stage attritions have become more common over the years: the vast majority of R&D resources are wasted on products that never reach the market. Overcapacity in the Industry. Spending on biopharma R&D increased from $30 billion in 1990 to about $140 billion in 2014, and it is fair to ask whether companies can realistically expect payback from such a large investment of resources. Stricter Reimbursement Conditions Imposed by Payers and Effectively Shorter Exclusivity Periods. The joint effect of these two developments is a growing pressure on pricing and access, as well as an increasing tendency to favor generics. The As-Yet Limited Takeoff of Personalized Medicine. The target populations are notably small, and companies have had to spend heavily on basic research and screening (the basic-research-brute-force bias). Accordingly, the return on investment has, so far, been meager, though the endeavor remains a very worthy one. It is not really possible to measure R&D productivity directly with any great precision. All measures are approximate at best, given the long time lines between investment and payback. However, various analyses conducted over different time lines all indicate a remarkably wide spread of productivity from company to company. See, for example, Ulrik Schulze et al., “R&D Productivity: On the Comeback Trail,” Nature Reviews Drug Discovery 13 (2014): 331–332. The assessment compares medians rather than means in order to avoid the impact of the extreme outliers and extreme underperformers. If we do compare means instead, the difference in productivity is even greater: sixfold. WHAT DOES THE INVESTOR COMMUNITY THINK ABOUT THE PROSPECTS OF BIOPHARMA R&D? For a forward-looking view of productivity, it is helpful to assess how much value investors are ascribing to companies’ R&D efforts. Since 2010, BCG has been conducting a sum-of-parts analysis to estimate the contribution of R&D to enterprise value. The analysis compares all companies that meet the following criteria: the company is publicly traded, its market capitalization is at least $50 billion, and its prominent activity is drug R&D and commercialization. (See the exhibit below.) For each company, the analysis separates R&D into late-stage products (well-defined enough for analysts to be able to make revenue projections) and the rest of R&D (which is a residual valuation representing the value that investors ascribe to the company over and above the value of the in-line portfolio and late-stage pipeline). Among the factors contributing to this residual valuation are the level of confidence in management’s ability to sustain innovation; the value ascribed to all underlying growth platforms; and the perceived ability to acquire, develop, and integrate as-yet unidentified assets. Two notable findings emerge from the analysis. First, there is wide divergence across the industry: some outliers have been regarded over the years as having very promising R&D engines, while others have been viewed less favorably. Second, the investor view of the industry’s overall R&D capability has grown considerably more upbeat over the past six years. The value of the outliers’ outperformance is huge, amounting to billions of dollars and an invaluable boost to human health. The dichotomy implies that in addition to the causal factors listed above, which affect all companies more or less equally, there must be additional factors at work that differentiate the top performers from the poor performers. Our collective experience strongly bears out this supposition and points to a true and actionable basis for achieving high productivity in biopharma R&D. R&D productivity depends on the ability to generate sound ideas internally—or to import them from the outside—and then translate them efficiently into impactful medicines. It turns out that the key predictor of relative R&D productivity, and the characteristic of the outlier companies that most distinguishes them from the rest, is the effectiveness of the organization: the way that decisions are made in light of the available data, the way that people spend their time, and the quality of interactions within and across teams—or in broad terms, the degree to which the workforce optimizes its individual and collective efforts in pursuit of the company’s best interests. A highly effective organization is one that can get people to act optimally—in particular, to make the best possible decisions—for a common cause rather than out of self-interest that is at odds with the common cause. R&D organizations are constantly making (or hesitating to make) strategic decisions when vested interests are at stake: for instance, reducing the funding for a trial, or even terminating a trial; externalizing certain capabilities; or in-licensing a promising candidate drug that will compete with, and possibly overshadow, a favored internal candidate. Organizational effectiveness is a subject largely neglected by the literature on R&D productivity, which concentrates instead on the industry-wide challenges listed above. Yet organizational effectiveness turns out to be a far greater determinant of relative performance than any of the listed challenges—and than the other commonly favored factors such as company size or the location of company headquarters. Our wide-ranging work in the industry indicates that the way for companies to really boost the productivity of their R&D efforts is by sharpening their organizational effectiveness. These findings derive from our experience. They are confirmed by research. BCG recently conducted a case-controlled study to put them to the test.6 The study analyzed an entire decade’s worth of candidate molecules for correlation with success or failure and found that the attributes most strongly correlated with success were those associated with organizational effectiveness. Michael Ringel et al., “Does Size Matter in R&D Productivity? If Not, What Does?” Nature Reviews Drug Discovery 12 (2013): 901–902. This conclusion is endorsed by those most closely involved with the actual issues—biopharma executives. Our extensive discussions with R&D executives across the industry suggest a broad consensus on the drivers of R&D success. Further confirmation comes from another recent BCG study, focused on executives’ views of biopharma productivity. (See Can R&D Be Fixed? Lessons from Biopharma Outliers, BCG Focus, September 2011.) The factors most prominently and consistently cited by the executives are related to organizational effectiveness: notably, corporate culture, the management of talent, communication techniques, and workforce incentives. Factors unrelated to organizational effectiveness, such as superior technology and smarter scientists, were considered far less important. Organizational effectiveness is clearly a key theme. It is worth discussing in more detail. An organization’s performance depends first and last on behavior, which matters above all else. Behavior is defined simply as what people do—the actions they take, the decisions they make, the interactions they engage in. It is the true determinant of productivity. So to transform productivity, the emphasis should be on changing people’s behavior or, rather, developing an organizational context that gets people to change their own behavior. Effective organizations abound in behavior that can be characterized as cooperation. Cooperation is the essence of teamwork: it means devoting one’s efforts to working with others toward a shared goal and taking their needs and constraints into account in order to improve their effectiveness. In other words, cooperation means tuning individual preferences and goals to bring them into harmony with those that are common to all, such that the whole is greater than the sum of the parts. Cooperation is distinguished from collaboration and coordination, which do not necessarily promote collective efficiency. (See “Cooperation Is Distinct from Collaboration and Coordination.”) If people need to adjust their behavior in order to cooperate, they often have to forgo their own immediate interests somewhat—incur an adjustment cost—in the cause of synergy and the greater good. The task of leadership, therefore, is to create a context that aligns the individual’s interests with those of the common cause: that is, to make it in everyone’s interests to pursue the collective interest. This is far from easy, since cooperation tends to put individuals at risk: individual contributions to joint output are difficult to measure directly, so an individual might receive insufficient credit when things go right and excessive blame when things go wrong. It’s not difficult to see why true cooperation is such a rarity in organizations. Yves Morieux and Peter Tollman, Six Simple Rules: How to Manage Complexity without Getting Complicated (Boston: Harvard Business Review Press, 2014). If you cooperate, you adjust what you do—your decisions and your actions—taking the needs and situations of others into account. Such adjustment comes at a personal cost: you relinquish your own immediate best interests for the sake of the common good. Cooperation involves working toward joint results or shared goals: it differs from collaboration and coordination, which emphasize joint processes and don’t require the adjustments inherent in cooperation. More specifically, collaboration is concerned not so much with the outcome as with “getting along” with one’s coworkers—having good interpersonal relationships. And coordination is about taking interdependencies into account in order to avoid clashes, usually through procedures or interface structures. By prioritizing interpersonal harmony and structured interaction, collaboration and coordination can actually militate against optimal decision making. Sometimes, interpersonal tension—even confrontation—is crucial to making hard choices. For example, whether to terminate work on a molecule early is far from an easy decision. Cooperation recognizes that: it is less concerned with “making nice” than with “making right.” When teams cooperate, they are working closely together on a single “thing,” and that alone is where they direct their efforts. The focus is on optimization for the group, and that can produce interpersonal tension, since the participants have a shared goal but are unlikely to agree spontaneously on their respective contributions to reaching it. Cooperation is, therefore, noticeably more demanding than collaboration or coordination, and people need to feel that the goal is worth their while before they agree to cooperate. In other words, for employees to pay the requisite adjustment costs, adjusting must be worth their while: they need to see that cooperative behavior will prove to be “individually winning” rather than just good for the group. In that regard, note that people behave rationally: their behavior reflects what they perceive as their best interests in their current environment, given the amount of information they possess, the time available to them for making a decision, and the limits of their cognitive abilities.8 To change behavior, therefore, the organization needs to make the new and desirable behavior rational for the individual. Cooperation is not easily achieved, but it can be achieved using this new approach. Organizations that align the interests of the individual with the interests of the group are organizations that are able to outperform. This approach to managing any organization—not least an R&D organization—differs markedly from some of the most common (and misguided) management approaches in two key ways. One all-too-common approach is to seek to change behavior through appeals to values and emotions, attempting to understand behavior by means of (pseudo) psychological interpretations. Such an approach is doomed to fail. Is it really so easy to directly change people’s values or beliefs or to get them to act against their own interests? In contrast, the new approach, as advocated here—changing the situation or context—is readily achievable: the organization actually has a fair amount of control. Once the rules of the game change, the players will quickly adapt their behavior. (Eventually, their mind-sets will change as well, to match the new situation.) Another common approach is to link organizational levers—such as objectives, performance criteria, and compensation—directly to outcomes. For more on “bounded rationality,” see Herbert A. Simon, “A Behavioral Model of Rational Choice,” Models of Man: Social and Rational (New York: Wiley, 1957). In fostering cooperation in this way, the organization simultaneously increases engagement. Engagement, or the motivation to do well at work, is what’s required for people to go the extra mile, beyond just disciplined execution. Engagement tends to dissipate quickly in an environment in which it is difficult to cooperate: work rapidly becomes less meaningful for employees. Individuals who cooperate within an organization become more engaged with the goals of the company and its overall mission, and, as a result, the organization itself becomes more productive and more likely to regularly outperform. In the biopharmaceutical industry, strong workforce engagement should be readily achievable. After all, the industry’s mission is to enhance human health, and keeping a sharp focus on the patient tends to be very motivational for employees. Nevertheless, even biopharma R&D cannot maintain workforce engagement if cooperation in the workplace is lacking. And as it happens, biopharma R&D has four inherent characteristics that make cooperation particularly difficult to achieve. R&D of any kind is, by its nature, an exploratory and difficult pursuit. All the more so in the case of biopharma R&D, which has four characteristics that make it particularly demanding. Company leaders aiming to enhance cooperation within the workforce need to find ways to overcome the challenges resulting from these characteristics. The challenges can and should be treated, however, as opportunities for enhancing cooperation. High Failure Rates. It is the nature of the business that a high proportion of R&D assets fail. Failures at later stages of development are of two kinds: a noble failure is one in which a promising candidate drug stumbles—unpredictably—at the last hurdle; a wasteful failure is one in which a doomed candidate drug is overvalued and pointlessly progressed until eventually its deficiencies become too obvious to overlook. Wasteful failures are wasteful in two ways. In addition to the sunk costs, there are the opportunity costs: think how helpful those wasted resources might have been had they been deployed on other, more promising projects. How and why do so many wasteful failures occur? The broad reason is simply that in many organizations, it is in somebody’s interests to avoid terminating a candidate drug early on. In these organizations, the person who is leading or supporting a program tends to enjoy greater visibility, job security, promotion prospects, and access to resources. So a team, unit, or function might have a strong incentive to progress the pet asset even when the signs are unfavorable. But how do they get away with it? First, the overall failure rate is so high—unavoidably high—that it creates an overall context in which failure is expected and broadly accepted and in which wasteful failures are seldom called out as such. Second, there’s always the chance that the program will defy the odds and succeed. Any long-serving executive can point to such exceptions or name a maverick genius who was eventually vindicated. R&D operates in a probabilistic environment, and it is important to keep an open mind. But in a game of probabilities, it is unwise to bet on the basis of past aberrations or to use them as justification for pursuing inauspicious hunches. All too often, biopharma R&D organizations fail to differentiate adequately between noble and wasteful failures and to discourage and preempt the latter sufficiently. Imprudent progression decisions of this kind are pervasive in the industry. Consider this revealing story. A few years ago, researchers at Pfizer published a powerful study showing the implications of a preference for “progression seeking” behavior—progressing a candidate drug along the R&D pipeline when termination might be indicated.10 They reviewed the company’s Phase I products that had been progressed, and found that two-thirds of them could have been recognized, at the time of progression and on the basis of available data, as almost-certain failures. These unpromising compounds were nevertheless moved forward in the pipeline in response to the progression-seeking impulse. Although the study focused on Pfizer, our experience is that this same impulse exists in many other biopharma R&D organizations. Such behaviors—although they are fully rational, given the context—cost the industry many billions of dollars each year. Lengthy Cycle Times. During the many years it takes to develop and bring a drug to market, the people working on it tend to get promoted, leave the company, or hand off the drug to another team for a variety of reasons. Even for those who are involved for the entire duration of the project, the consequences of actions early in development may not be felt until far in the future. As a result, it is difficult—if not impossible—to obtain direct feedback about which steps are leading to productive, value-adding outcomes. Given the distance separating actions and consequences (or the complete disconnection, in the case of individuals who leave the company or move on to different roles), management often, sensibly enough, creates interim goals. These can become problems in themselves, however, because people tend to regard them as independent end points, and sometimes the interim goals even conflict with the overall aim of the company. Laboring to achieve interim goals can lead to uncooperative and shortsighted behavior, thereby stunting productivity. Our research suggests that product development can take as much as two years more than necessary because of the handoffs and the distance between actions and consequences. Across the industry, perhaps the most prominent and common interim goal is that of achieving proof of concept at the end of Phase II. For Discovery and Early-Development organizations, proof of concept represents the pinnacle of success. The trouble is, it can become an end in itself, even if the data generated is different from what is needed for registration and approval. Such mismatches are particularly frustrating in a world in which accelerated approval is sometimes granted for breakthrough therapies. High Specialization. Biopharma R&D requires expertise in many specialist fields, so R&D organizations are necessarily organized into various highly technical functions, each with a level of knowledge that excludes others. Specialization is rightly valued, so functional units tend to have considerable power to influence what gets done. The danger is that these units become, in effect, a set of minimonopolies, operating in a self-serving way rather than cooperating with other units in the best interests of the enterprise overall. In such a fragmented setting, there is little incentive for cooperation: a function’s rational preference is to optimize for its own specific priorities instead of the priorities of the company as a whole or of the portfolio of individual assets being progressed along the R&D value chain. The cost of this breakdown in cooperation can be enormous. Compound progression can be subject to long pauses or slow spells, which raise the costs of drug development, delay registration and patient access, and make the drug less competitive by reducing or eliminating its chances of being first to market. The financial implications can be dire. Missing a year or two of exclusivity—or, even worse, coming to market second instead of first—can cost hundreds of millions of dollars per drug if not more. Another effect can be severe frustration and, eventually, disengagement among the workforce, particularly on the product teams. How are they to do their job of progressing a compound expeditiously if the environment is so uncooperative and unsupportive? Heavy Regulation. The extensive regulation now governing the industry is valuable in many respects, but it can intensify the problems related to cooperation. Faced with a heavy regulatory regime, many R&D organizations respond by reinforcing rule-based systems to ensure regulatory compliance. Compliance is crucial, of course, but sometimes the systems become excessively restrictive and so intricate or inflexible that they end up detracting from teamwork, innovation, and creativity—qualities that cooperation relies on. The ideal approach to enhancing cooperation differs from R&D organization to R&D organization, according to each one’s specific circumstances. Still, it is worth looking at the experience of one notable outlier: Bristol-Myers Squibb. BMS’s sustained record of high R&D productivity is the fruit of a cohesive set of policies, which collectively serve the cause of organizational effectiveness. These policies include the close engagement of leadership with the progress of each asset and the portfolio as a whole; a steady focus on areas of unmet need; an uncompromising determination to “follow the science”; and conscientious integration with other divisions, such as Commercial and Manufacturing. More recently, the organization has introduced changes to its organization model in order to promote ongoing superior performance and increase speed to market. These changes can be grouped into the following five broad, mutually reinforcing imperatives that maximize cooperation. 1. Strengthen the integrating role of portfolio governance. Governance is the decision-making process that determines which R&D projects are funded and implemented in the company’s pipeline and how the funding and implementation should proceed. Governance plays a critical role as an integrator—promoting cooperation among people in different functions and teams to best serve the interests of the portfolio. More specifically, governance facilitates truth-seeking decisions (described below) by assessing assets in a holistic way and terminating as soon as possible any programs unlikely to succeed. In addition, governance has a unique ability to look across assets, allocate resources effectively across the portfolio, and determine at a portfolio level what business risks to undertake. In many R&D organizations in the industry, governance suffers from a “dual role” problem. Governance members are typically drawn from the ranks of senior functional leaders, whose natural tendency might be to prioritize the interests of their functions rather than to promote the enterprise view. To make matters worse, governance decisions in R&D can be particularly tricky. In an environment of high failure rates, it is often difficult to make accurate calls, particularly about when to terminate assets. Furthermore, a decision that is subsequently invalidated can impair the reputation of the associated decision maker. In the face of these challenges, uncooperative behaviors may proliferate. Decision makers at the portfolio level may delay decisions, waste time in meetings, send weak signals about what should be done next, and ultimately create new processes and committees in an effort to compensate. In many cases, they avoid making or communicating clear decisions, because “plausible deniability” seems to be the safest option. To reinforce the role of governance as an integrator, BMS has been making several changes to its governance model. The accountability of the governance leader has been clarified and enhanced. Among the main responsibilities of the person in that role is the task of facilitating productive, integrative conversation. The roles for governance teams and members have also been clarified through role charters, which clearly define people’s accountabilities, expected behaviors, success metrics, and decision rights. Governance committees have been reconstituted, and each member has a well-defined role. Most committees have been reduced in size to enable prompt and high-quality decision making. Members are expected to prepare properly for meetings, to participate actively, and to provide feedback afterwards. Meetings are open only to those who are invited, and the decisions that are made in meetings are to be reported within hours. In addition, several procedural changes have been instituted. First, the organization is reducing the number of governance reviews. Previously, teams had to endure “triple jeopardy” at the hands of governance: multiple reviews for strategic endorsement, funding approval, and an operational plan review. Now they go through a single approval process that combines all aspects of program progression. Second, governance is tightening its procedures for communicating with teams. Previously, the winning strategy for teams was to engineer an “orderly” governance discussion by conducting extensive premeetings with functional leaders to build alignment and support. Such premeetings were time-consuming, took up valuable resources, and reduced the effectiveness of the governance meeting itself, which lacked true engagement and cooperation. In short, the premeetings provided a resource for various actors to avoid cooperation. These premeetings have been eliminated, and governance is better able to view the various competing interests and can get the teams or individuals to make trade-offs in a truly cooperative way. In fact, a primary function of governance today is to mediate in areas of disagreement between functions and teams by discussing, for example, the regulatory consequences implied by various courses of action. A third change is the implementation of a feedback survey for each governance committee—described as a rigorous survey “with teeth”—in which all participants rate the process relative to the established norms and rate one another’s behaviors relative to their established role charters. The overall effect is that governance now plays a stronger and more integrative role within the R&D organization than it did previously. Its increased involvement has had the effect of boosting cooperation considerably within the organization. And now that the various teams and individuals feel the benefits of cooperation and see far more meaning in the governance process, bureaucracy has diminished, senior leaders are more deeply engaged than ever before, and motivation has increased throughout the organization. 2. Increase the power of product team leaders. In the development process, product team leaders are natural integrators. They require cooperation from and among people in various functions in order to get their own jobs done. In many companies, however, team leaders—except for those working on high-profile flagship products—lack the necessary power to play the leadership role expected. In many cases, product team leaders are junior to functional leaders, so product team leaders, especially those who aspire to join the senior functional ranks in the future, are inclined to submit. While this low-power status persists, they remain severely and frustratingly limited in their ability to make the necessary cross-functional trade-offs that would optimize their asset’s development path. They find it very difficult if not impossible to be innovative, take appropriate risks, and drive performance. The aim, then, is to empower product team leaders as integrators, and BMS’s R&D organization is implementing several options to that end. (Power can be defined as influence over matters that are important to others. Although more senior managers generally hold greater power than their junior colleagues, it is not always so. Power is not necessarily a function of organizational level or standing.) BMS team leaders now report to higher levels in the organization than they did previously. In fact, they now all report directly to the heads of Development—the people who have the power to get things done. And, rather than being layered under functional leaders, the team leaders now are just two layers below the head of R&D. In keeping with this more prominent reporting line, the role itself has been given more senior status. Team leaders have been granted additional powers. For instance, product team leaders now have more influence in the selection of their functional team members. Previously, that selection had been a decision for the functional leadership alone. This small change enables the product team leaders to make trade-offs when selecting team members and also highlights the functional team members who are in demand by multiple teams. That in turn gives these functional team members some say in selecting the team they would prefer to join—particularly if they have developed a reputation for cooperating and optimizing for assets. Another new power that BMS has given to product team leaders is that of contributing to the performance evaluations of key functional leaders. As a result, the product teams have greater sway over the functions—enough to drive the requisite cooperation. In addition, BMS has created new career paths for product team leaders. Promotions can now occur outside of functions. (An early example of this policy change has been the appointment of team leaders to be heads of Pharmacovigilance and Medical Affairs.) Overall, product team leaders now have greater opportunity to achieve seniority, and they are less reliant on the evaluation of those with whom they might conflict in the course of the productive and sometimes tense relationship that cooperation typically involves. 3. Optimize for assets rather than functional interests. In light of the high specialization and long cycle times that characterize biopharma R&D, the various functions often fail to cooperate. There is a lack of effective teamwork across the functions in service of the assets being developed. Functions tend to optimize for individual functional requirements, and that can actually prove a disadvantage to individual assets. This self-serving tendency toward functional optimization can manifest itself in several ways in R&D organizations. For example, functional leaders sometimes insist on retaining the full allocation of their default program time line to complete a certain functional process, even when a shortcut would greatly benefit the asset overall and free up critical resources earlier. They might maintain time buffers and keep key resources in reserve—so as to have them readily available in case a high-visibility “squeaky” project team should demand them—rather than deploying the resources for equally deserving but lower-visibility projects. And they might defend their budget reserves and process buffers by means of highly complex, function-specific explanations that are too technical for outsiders to understand and, therefore, are difficult to challenge. Seeing a clear need to optimize for assets rather than functional interests, BMS is adopting an important change in the way it operates. Traditionally, one major source of the functions’ power was that they, rather than the teams, had control over resources—personnel and budget. What’s more, they used to have power over key decisions. In the past, they had 45 veto opportunities, “sub-decisions,” that allowed them to overrule the product teams between first-in-human testing and registration. BMS has now eliminated this veto power, reducing the 45 subdecisions to 15, which are now framed as a checklist rather than a catalog of vetoes. Functional heads may no longer ignore governance recommendations related, for instance, to allowing a team to accelerate a development time line by 25%. Instead, they have to make their dissent explicit and resolve the disagreement in formal discussions during governance meetings. With the elimination of this veto power, the context has also changed: the functions can no longer claim complete control over resources. 4. Ensure reciprocity across organizational boundaries—such as those between Discovery and Development, or between Early Development and Late Development. With such long cycle times, it can take years to learn the consequences of an action taken early in Development. The lag time between actions and consequences is so great that R&D executives are bound to create interim goals. However, unexpected problems arise when these interim goals are treated as independent end points and are pursued diligently without reference to the bigger picture. Cooperation, productivity, and the company’s overall interests are the casualties. Consider this scenario. The time between a drug’s first human testing and its registration can be roughly eight years. Companies are not going to wait eight years to reward those involved in Development, so they typically opt to reward teams at specified milestones. This is, on the face of it, a sensible organizational reaction. Many people switch jobs during the eight-year time frame, and it would be unfair to exclude them from the rewards of success. In any case, it’s better to evaluate employees within shorter periods. Unfortunately, these milestones are often regarded as ends in themselves, and individuals or teams strive to reach them even when the effort hinders or distracts them from reaching the true goal: namely, getting approval for medicines and making them available to patients. An interim milestone at proof of concept, for example, seems a perfectly reasonable milestone on the road to registration, but focusing exclusively on reaching the milestone, without looking beyond it, will likely complicate the back end of Development. Yet, if meeting this milestone becomes the yardstick by which people are measured, then they naturally do focus exclusively on the milestone, viewing it as an end in itself, which they are expected to reach through the most efficient paths, regardless of the consequences for others. As far as they are concerned, it is their priority. In fact, it is their job. The upshot could then be that clinical trials are conducted toward an indication for which the product will never be registered, and the trials will have to be repeated for the required indication. Another possible result would be the elimination of trial arms that could prove useful and efficient in the long term but, because they might take more time, would delay attainment of the interim goal. The overall effect is to impede cooperation, thereby generating a series of delays and an abundance of duplicated effort. Effective organizations can mitigate these effects, however, by extending the “shadow of the future”—finding better ways for people to experience more directly the consequences of their actions. To discourage shortsightedness, BMS has established a single governance committee at the highest level, the Pipeline Strategy Committee, which has accountability for strategy and funding decisions along the full length of the value chain. This committee replaced two committees that operated independently of each other and oversaw shorter program durations. Additionally, BMS has established a shared set of objectives—both quantitative and qualitative and visible to company and board leadership—across the R&D organization in order to increase reciprocity among its various components. This compilation creates a framework for reinforcing cooperation, and it helps show how the different parts of the organization contribute to the overall goals. The organization has also established joint accountability—for example, for achieving proof of concept—of leaders across organizational boundaries. As a result, it is no longer easy to engage in plausible deniability. Moreover, there has been a marked improvement in cooperation between R&D and other BMS units, such as Business Development. To further discourage shortsightedness, BMS has introduced a change in approach to early governance reviews and to team formation and leadership: the aim is to ensure that the team and its leader (or a deputy) see that they are accountable for guiding the product beyond the interim goal rather than being accountable only up to the moment of handoff—for example, at proof of concept. In some cases, that team and/or its leader could continue the program all the way into registration work. Faced with that responsibility, the team leader should now find it rational to take a longer-term perspective that is better aligned with the company’s best interests. Finally, to boost mutual understanding of roles and enhance cross-team performance, BMS has greatly increased the mobility of talent across organizational boundaries. It is now the norm that team leaders as well as functional and operational personnel move into new roles. There are already several instances of Full Development team leaders transitioning to roles in Early Development and vice versa. Operational specialists have likewise been able to migrate among Early Development, Late Development, and Medical Affairs. 5. Promote truth-seeking behavior rather than progression-seeking behavior. It is not unusual for R&D staff to develop a progression-seeking rather than a truth-seeking tendency, progressing candidate assets even when continuation may be unwarranted. This inclination is a perfectly rational response to the organizational context—the reward system that many biopharma R&D organizations adopt. Rewards include not only bonuses and raises but also nonmonetary elements such as enhanced reputation, job security, access to resources, organizational power, and promotion prospects. By giving rewards to those associated with successful drugs and overlooking or inadvertently penalizing those associated with terminations, a company is in effect unwittingly encouraging decision makers to progress even unpromising candidate drugs—just in case. In other words, the company is, unintentionally, perpetuating behavior—rational, individually winning behavior—that is misaligned with its own overall goals. Such progression-seeking behavior can take many forms in biopharma R&D. A product manager emphasizes the upside and downplays the downside of a favored product, for instance, when discussing it at a governance meeting. The champions of a candidate drug hold premeetings with several key decision makers prior to a crucial meeting, working to shore up support for progressing their protégé. Or they ascribe its rumored weaknesses to heretofore insufficient funding and suggest that the remedy lies in additional development. Such behaviors are fully rational, given the context. Many of the changes mentioned above, in particular those relating to governance, have served to reduce such counterproductive behaviors and to promote truth seeking over progression seeking. BMS executives are now turning their attention to additional interventions, some of which have been successfully implemented elsewhere. One promising initiative involves adjusting the team-leader career path so that advancement is no longer so dependent on being associated with a product that is being progressed. Instead, advancement now hinges on accurate decision making that is the result of astutely weighing the pros and cons of progression. Note that this intervention is not intended to downplay the importance of progressing assets. R&D organizations must move assets forward in order to create value, and teams should certainly be rewarded when they help bring assets to market. But a company does itself no favors if it encourages progression to occur at the expense of good decision making, or more broadly, truth seeking. Once the system starts rewarding teams and functional lead-ers for terminating a product at the appropriate time—not just for carrying a product through—these decision makers will have a rational desire to apply a truth-seeking lens. A second intervention under consideration is the introduction of a new information source that enables better truth-seeking decisions. A new procedure might be implemented for evaluating internal assets, similar to the evaluation that is typically made on possible external assets. Portfolio leaders would have the option of commissioning an independent and potentially antithetical review by internal or external experts who have no personal attachment to any particular product. Such a review would provide the team and governance leaders with a more balanced view, make in-house assumptions more transparent, and enhance decision making. The particular challenges faced by biopharma R&D organizations are formidable. It is not always easy to engage these challenges let alone overcome them, but doing so in the right way can bring a huge competitive advantage. BMS, for example, believes that acting on the five imperatives outlined above will reduce time to market, bringing significant value to patients and further improving productivity. Indeed, there is already evidence that BMS’s pipeline progression has sped up. Moreover, there are signs that the initiatives are increasing engagement and motivation and are improving decision making. The five imperatives listed above were developed in response to BMS’s unique circumstances. Other companies, with their own unique circumstances, will have different imperatives to identify and pursue. BMS’s experience is, however, an instructive model. The organization’s sharp focus on organizational effectiveness to foster a productive R&D environment has been extraordinarily energizing as well as effective and is contributing to the company’s continued status as an outlier in R&D productivity. Pharmaceutical R&D is a seriously difficult pursuit that poses several problems specific to the pharmaceutical industry. But leaders can improve productivity markedly if they understand workforce behavior accurately and shape it into something more cooperative and more aligned with company goals. They can achieve higher-value output; can engage and motivate their people better, thereby attracting stronger talent; and can realize considerable savings in the process by economizing on workforce effort and increasing workforce engagement and retention. This conclusion is not the product of mere theoretical or wishful thinking. The approach can be applied in practice and—as BMS has demonstrated—with great success. Executives who aim to increase the effectiveness of their own organization should consider our findings. The ultimate goal is performance—specifically, in facilitating the development of transformational medicines. Despite the general decline in R&D productivity, some companies do outperform impressively, registering productivity similar to that of the industry’s heyday. The basis of their success is something other than serendipity. They have cultivated an R&D environment that encourages cooperation, and the result is that they are much more likely to make good decisions than bad ones. Creating such an environment is within the power of executives who are willing to dedicate the necessary time and energy. Behaviors are what really matter. People’s behavior—the decisions that people make, the interactions that they choose to have, the actions that they take—drives performance. By identifying unhelpful current behaviors and defining the alternative behaviors necessary for higher performance, companies can define the optimal interventions. The interventions themselves should be viewed in terms of behavior: they involve adjusting employees’ contexts in such a way that they will find it rational to adopt more cooperative behaviors. Contrast this approach with the more common form of management practice, which emphasizes abstractions—such as systems, structures, processes, and incentives—without concentrating on what’s actually happening on the ground. People behave in a rational, individually winning way. When colleagues are acting in counterproductive ways, they are doing so for a reason: from their point of view, it is advantageous to act that way. Telling them to behave differently doesn’t work. People don’t generally choose deliberately to act in ways that run counter to their interests. Management needs to review the current context and change those features that provide the rationale for perverse behaviors. In many cases, managers fail because they try to shape that context at the group level. For example, they might build the case for a “burning platform” or give company-wide speeches about how everyone would be better off if things were done differently. Context, however, operates on an individual level: if the desired behavior isn’t individually winning behavior, it will fail to take hold at the individual level and, therefore, at the group level. Instead of instructing colleagues to do things differently, management should adjust the context so that operating differently becomes the rational course of action for them and—more specifically—so that it is in their own best interests to act in the organization’s best interests. A few Simple Rules can help with a far from simple transformation. For employees to act in the organization’s best interests, they need both the ability and the desire to do so. Companies can increase employees’ ability to do so by giving them the appropriate resources, removing constraints, and creating transparency about what they do and what others do. Companies can increase employees’ desire to do so by lengthening the shadow of the future and linking consequences more tightly to action, by requiring reciprocity and eliminating dysfunctional self-sufficiency, and by rewarding cooperation. Your R&D productivity is in your own hands. With effective management, your organization can take the right actions and outperform. More broadly, it can benefit the industry as a whole, draw more investment to R&D, and contribute even more to the welfare of the world. The authors would like to express their gratitude to Yves Morieux, a senior partner and managing director in BCG’s Washington, DC, office, and their deep appreciation for his pioneering work in the area of improving organizational effectiveness. This paper draws heavily on the smart simplicity framework developed originally by him and detailed in Six Simple Rules: How to Manage Complexity without Getting Complicated (Boston: Harvard Business Review Press, 2014), which he coauthored with Peter Tollman. We offer further thanks to Alister Thomson, Scott Taylor, and Anusha Sivaramakrishnan of BMS. They have led the development and implementation of these concepts within the BMS R&D organization—an effort that has included many other leaders within the organization. Thanks also to Joseph Brilando and Brett Schiedermayer of the BCG ValueScience Center for the analysis and insights that their work has provided. The authors have benefited greatly from the direct input of many BCG colleagues and convey their par-ticular thanks to Michael Ringel and Ulrik Schulze for their expert reflections on biopharmaceutical R&D productivity and to Maria Denslow, Sean Jeffries, and, especially, Shaheer Rizvi for their contributions to the realization of this report.